State-of-the-art gas piston lift mechanism uses just a few moving parts. This durable, reliable commercial-grade mechanism is designed for daily use and is preferred for use in condos, homes and hotels including Walt Disney World® and DisneyLand® resorts. NO FLOOR MOUNTING – the mechanism is completely contained within the cabinet which attaches to the wall at the studs. Panel bed design eliminates bi-fold doors. Pistons install in seconds and are not subject to metal fatigue, breakage or catastrophic failure. Should a piston need to be replaced, it can be replaced in seconds without tools and without disassembling the bed. Once constructed, the bed assembles and installs in minutes. Unique locking leg mechanism prevents the bed from being lowered incorrectly and locks the bed inside the cabinet when not in use. Easily moved without permanent floor damage or holes in carpet. Lifetime warranty on the mechanism components if the correct materials, mattress and mounting positions are used. The original century-old folding bed mechanism design uses old-fashioned metal springs, a heavy metal frame and complicated floor mounting. Most require a cabinet with bulky bi-fold doors. 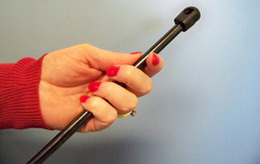 Other systems use as many as 18 metal springs mounted on both sides of the head of the bed and are not intended for daily use. Extreme caution, tools and heavy gloves must be used to install metal springs. Metal springs can break and cause injury and/or damage to the bed. Over time, metal springs can fatigue and stretch, causing the bed to sag out of the cabinet. Replacing metal springs is a complicated and potentially dangerous process that requires tools and major disassembly of the bed. No way to lock the bed inside the cabinet. Floor-mounted spring mechanism beds require complicated disassembly and will leave holes in the floor. When a warranty is offered, it’s a limited warranty of 5 to 15 years.